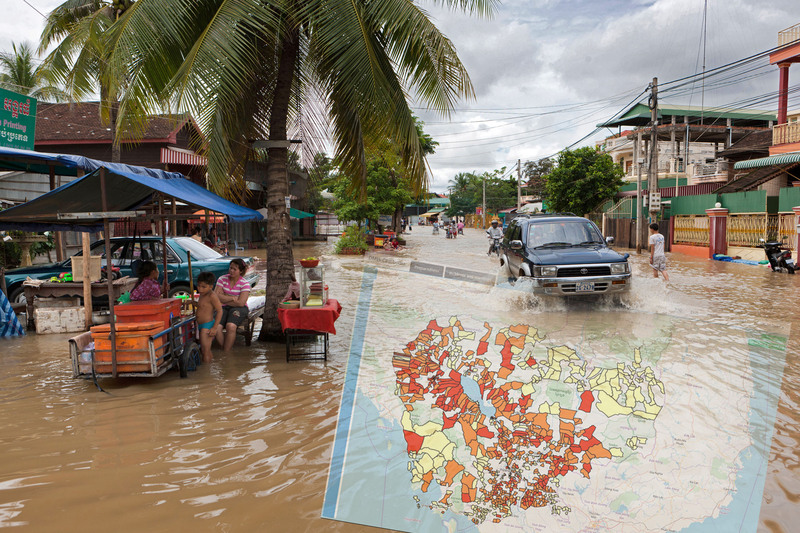 Stirling, Scotland, 07 June 2018 – thinkWhere, the Scotland based GIS company, is using the latest web based mapping technology to improve disaster management and response in Cambodia. With financial support from the German Federal Foreign Office and the United States Department of Agriculture, and on behalf of a partnership between the United Nations World Food Programme (WFP) and People in Need (PIN), thinkWhere has developed a Disaster Management Information System (DMIS) for the Royal Government of Cambodia. The thinkWhere development provides a mapping front end visualisation that builds on WFPs Platforms for Real-time Information Systems (PRISM), a data management, sharing, and visualisation initiative. With the aim of better providing sophisticated weather data, this partnership with PIN has made it possible to improve existing PRISM visualisation capabilities, to better support the Government’s ability to coordinate for disaster preparedness and response, and to better display aerial imagery as well as historical and live disaster information. “There are a lot of tools, platforms, maps and monitoring devices, which have been developed over the years in Cambodia for weather monitoring and collation of data on disaster response,” commented James Happell, Global Innovations Manager, People in Need – Cambodia. “Working with thinkWhere, WFP and PIN have been better able to support national efforts by the Government’s Disaster Management Committee to consolidate and centralise visualisations helpful for preparing and responding to disasters in one platform” commented Krisna Keo, IT Developer and PRISM Team Leader. Cambodia experienced brutal conflict and civil unrest between 1975 and 1991 leaving up to 3 million people dead and paused economic development. Despite strong economic growth in the decades since, Cambodia remains one of the poorest countries in the region, with approximately 30 per cent of its population living below the national poverty line. The Southeast Asian country has also been ranked as the 9th most disaster prone country in the world, facing recurrent floods, droughts and tropical storms. thinkWhere developed a cloud hosted AWS (Amazon Web Services) infrastructure making the platform easy to deploy and administer. Using open source tools and technologies ensures the DMIS can be easily integrated with third party systems and data and with an easy to use interface, DMIS offers a functional and information rich mapping service that can be accessed anywhere, anytime using a simple web browser. “We worked closely with thinkWhere from design, through to planning and deployment, and we were more than impressed with the communication, flexibility and dedication throughout the project,” commented James Happell. “Once finalised, the system will be primarily used by the National and Provincial Departments for Disaster Management, which currently have access to PRISM decision-making software in situations rooms across 13 provinces, with expansion planned to 19 (out of a total of 25 provinces) by the end of 2018” commented Andre Martinez, WFP PRISM Coordinator. It will show weather alerts, historical disaster information, information on vulnerable populations and infrastructure and real time disaster information from field staff. The World Food Programme is the food-assistance branch of the United Nations and the world’s largest humanitarian organisation addressing hunger and promoting food security. WFP has been working in Cambodia since 1979, initially helping the country recover from conflict and then focusing on sustainable development. People in Need, a Czech based non-profit, non-governmental humanitarian organisation, has been working in Cambodia since 2008 providing development and emergency assistance. Based in the historic city of Stirling, Scotland, with customers across the UK and worldwide, thinkWhere pioneered the development of web-based platforms for collaborative GIS products and services. The company has 10 year proven track record of delivering solutions at local, regional and national levels in the UK public and commercial sectors.